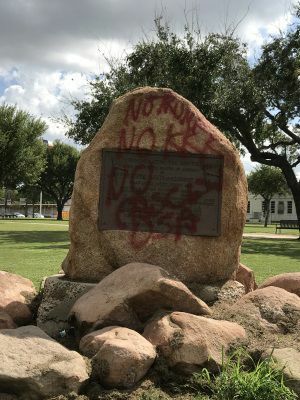 The Texas division of the Sons of Confederate Veterans Sixth Brigade is offering a $2,500 reward for the arrest and conviction of the individual or group responsible for defacing the Jefferson Davis monument at Washington Park in Brownsville. Mark Phillips, brigade commander of the group, said it met Monday night in Brownsville and decided to offer the reward. A report has been filed with the Brownsville Police Department, and it is investigating the case. Officials urge anyone with information on the incident to contact the Brownsville Police Department at (956) 548-7000 or Brownsville CrimeStoppers at (956) 546-8477.